Call it Reality TV run amok. In the future, an annual event called the Hunger Games is used to settle a score for a former uprising against the government. A boy and girl, age 12 to 18, are chosen from each district to fight to the death in a televised tournament. When Katniss Everdeen’s (Jennifer Lawrence) sister is chosen, Katniss offers up herself as the first–ever volunteer for the Hunger Games. The brutality of this beloved young adult novel can’t be disguised: it’s about children killing children. The movie’s PG–13 rating is for “intense violent thematic material and disturbing images — all involving teens.” ClearPlay cleans up a handful of mild profanities, and though bloody mayhem is trimmed, the idea behind the entire plot may be too intense for younger viewers. Violence as entertainment is more than a metaphor for sports and war. 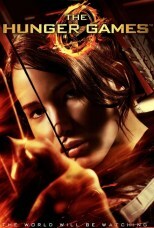 Aside from being a brilliant concept that hits uncomfortably close to home, The Hunger Games is well made and compelling. Jennifer Lawrence, Oscar–nominated for Winter’s Bone, adds gravitas to the role in this above–average adaptation. I just wouldn’t be too eager to show it to the whole family.